Brown beef in skillet and drain. While beef is browning, heat the taters until they are almost done. In a medium casserole dish, mix the green beans, cream of mushroom soup, and beef until well blended. 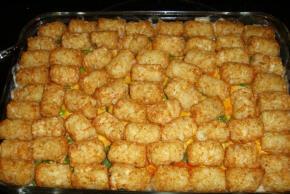 Cover evenly with tater tots. Bake at 350°F for 20 minutes. Cover with cheese and continue baking until cheese is completely melted. Serve!